Lock in a great price for Holiday Inn Express - New Albany – rated 8.1 by recent guests! The breakfast was very good. The cinnabons were scrumptious! Convenient to Yum Center where we were attending an event. Bright in room because the shade was opaque and the table lamp as a nightlight. Bed was comfortable and warm. Breakfast was better than expected. But best of all was the staff. They were friendly and helpful. The room was great! Very comfortable! Staff was great! Breakfast was fantastic, room was updated, clean and comfy. This is a great place to stay, close to highways to get to different places. The breakfast was better than some hotels we have stayed at. We will continue to stay at this location when we visit New Albany. The check in clerk was rude and seemed bothered we were interrupting her and the maintence mans tv show. But the male clerk leaving was professional and nice. 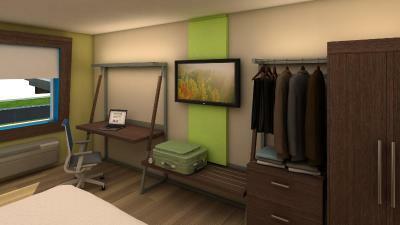 The room was great, I loved the design of it and the comfort. We will stay at this hotel every time we visit New Albany. Holiday Inn Express - New Albany This rating is a reflection of how the property compares to the industry standard when it comes to price, facilities and services available. It's based on a self-evaluation by the property. Use this rating to help choose your stay! Located off Interstate-64, this New Albany hotel is a 10-minute drive from downtown Louisville, Kentucky and the Louisville Slugger Museum. It features an indoor pool and spacious rooms with free Wi-Fi. A microwave, mini-fridge and coffee maker are standard in every modern room at the Hampton inn New Albany. All rooms include a cable TV and are warmly decorated with carpeted floors. 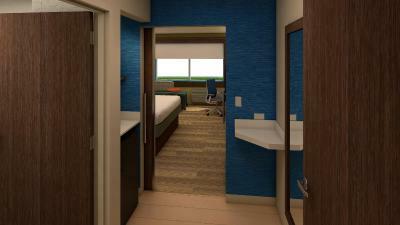 A daily continental breakfast is served at the New Albany Hampton Inn. It includes hot and cold items, as well as free coffee and juice. Free access to the gym and business center is provided to all guests of the Hampton Inn. Parking is also free on site. Shawnee Golf Course is a 6-minute drive from the hotel. Huber’s Orchard and Winery is 14 miles away. 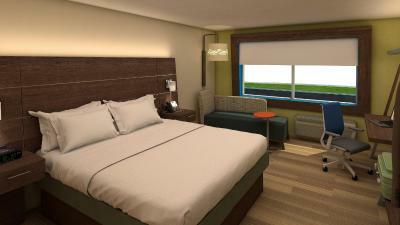 When would you like to stay at Holiday Inn Express - New Albany? 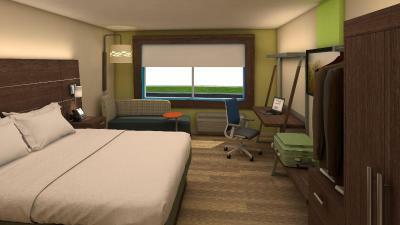 House Rules Holiday Inn Express - New Albany takes special requests – add in the next step! Holiday Inn Express - New Albany accepts these cards and reserves the right to temporarily hold an amount prior to arrival. The toilet needed to be a little taller and the bathtub had a weird v shape. Room was nice. Bed was a little hard but was ok. The pool was inoperable for the two days that we were there. With young children along that was a real downer. The batteries were dead in the remote. The shower curtain had a rip in it. The pool room was freezing to the point you couldn’t enjoy the indoor pool. The pool was one of the reasons we choose this hotel and the room being so cold was a disappointment. Liked everything. Hotel was perfect for what we needed. Have your night clerk talk without chips in her mouth. The refrigerator was frozen and mildew and the bed hard as a rock.